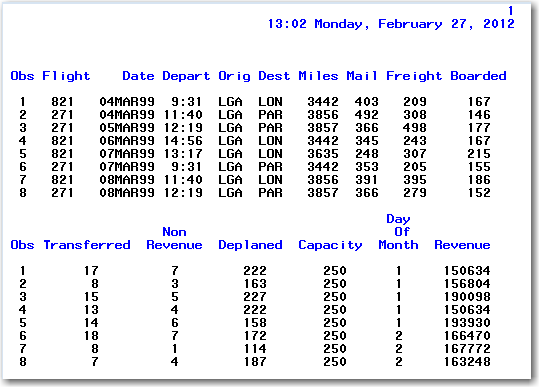 To set up practice data in SAS, select Help ->Learning SAS Programming from the main SAS menu. When the SAS Online Training Sample Data window appears, click OK to create sample data. If you are using SAS Studio or SAS University Edition, you might not have Write access to the Sasuser directory where the sample data is stored. Copy the sample data program into a new Code window in SAS Studio. You can access the sample data at http://support.sas.com/publishing/cert/sampdata.txt. In the Folders pane, select My Folders. Then, right-click and select New -> Folder. In the Name box, type a folder name. In our examples, we use the name certprep. Click Save. Note: You must use the filename of the new directory. In our examples, we use the name certprep. If you use another filename, substitute the name that you created for certprep. Right-click the new folder that you created and select Properties. Copy the path in the Location field>. Enter the following code, replacing location field with the path that you copied from the Location field. Save the program as libname_cert.sas. You must resubmit this LIBNAME statement program every time you work with the sample data. In the Welcome to SAS Enterprise window, select New Project. Select File -> New -> Program. If the result from the PROC OPTIONS code is RSASUSER, you must redirect the Sasuser folder by creating a new folder. From your server area, open the Files folder, right-click on a drive or folder, and select New Folder. Enter the new folder name. Note: If the result from the PROC OPTIONS code is NORSASUSER, the Sasuser folder is writable, and you do not have to redirect the Sasuser folder. Therefore, you can skip this step and the next one. Submit the following code in a Code window. Note: You must use the filename of the new folder. In our examples, we use the name certprep. If you use another filename, substitute the folder name that you created for certprep. Because you will not need to use these shortcuts, you can delete the Program item and all the shortcuts from the project. This action will not delete the data that you created. To delete the item from the project, right-click Program and select Delete. The following chapter numbers and page numbers apply to SAS Certification Prep Guide: Base Programming, ISBN number 978-1-60764-924-3. You can find the ISBN number on the copyright page. Note: The items in this list have been resolved and incorporated into the September 2015 iteration. Page numbers in other ISBN versions might vary. The "Creating Enhanced List and Summary Reports" chapter was removed from the third edition. "For example, to display the value 1234 as $1,234.00 in a report, you can use the DOLLAR8.2 format, as shown for Total below." In the table that follows (Table 1.9 Format Attribute), the Format for the variable Total should also be DOLLAR9.2. "In the following example, the observations are longer than 64 characters, so the output continues on a subsequent line." Notice that the Obs column numbers (1-8) are repeated because the observations have wrapped to the next line. 7 238 The bullet, "limit the label to 256 characters", should be "limit the label to 32767 characters". 11 339 The Selected PDV Variables table should contain a "Salary" column showing salary data rather than the "Payroll" column. 11 339 * This example requires the use of the data set USA, which you can access by running this SAS program (copy paste the contents of the text file into your SAS session and run it). 11 340 * This example requires the use of the data set USA, which you can access by running this SAS program (copy paste the contents of the text file into your SAS session and run it). 11 341 * This example requires the use of the data set USA, which you can access by running this SAS program (copy paste the contents of the text file into your SAS session and run it). 12 360 One to one merging should be one to one reading. 12 362-365 One to one merging should be one to one reading. 17 537 In the "Using List Input section, the fileref, Credit, should be Creditc. Appendix 1 Quiz Answer Keys 706 The correct answer should be "a. HTML and PDF". The explanation is correct. HTML output is created by default in the SAS windowing environment. These statements create HTML and PDF output.